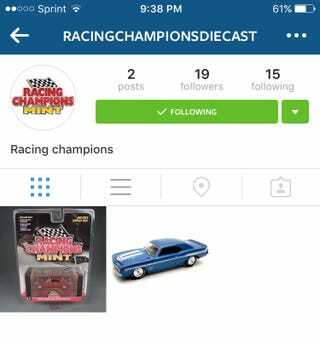 Racing Champions has a IG now! Seriously though, IG is a great way to create hype for a product, it’s baffling when a brand doesn’t use it. And IG isn’t Twitter or FB, it’s a picture-sharing application...you post pictures of your product so people can see it. Basically, IG is perfect for diecast pics. Anyways, I just wanted everyone to be aware of the new, unused RC’s page. :).